Sometime back I made these glazed “donut holes” and instantly wanted to make more batches, but with colors. 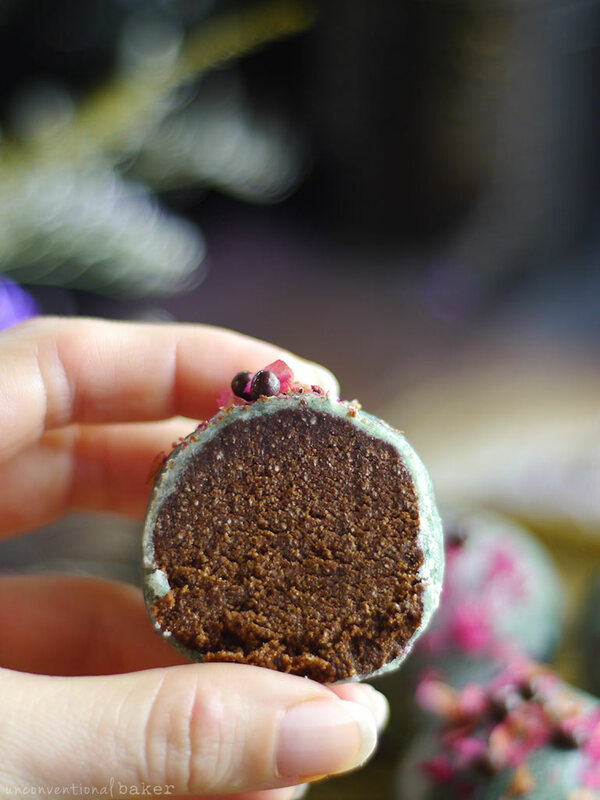 I made some pink with beetroot powder, yellow with turmeric, purple with maqui powder, and then spirulina happened and oh my goodness, I ended up with lovely truffles that really reminded me of jade (a gemstone I absolutely love). For some reason, although I normally associate gold and red with Chinese New Year colors, these truffles instantly made me think of China since jade is so beloved there, and so I knew they’d be the perfect treat for the occasion. So while we’re talking about colors, one quick little tip on these: more colored powder doesn’t mean a prettier color. At all. I know there’s this expectation that if you add more spirulina it will be “greener”, but the truth is it turns boggy. You’d think that if you add more turmeric the recipe will be “yellower”, but the opposite happens — it starts turning brown… and not a nice shade of brown either! You get the idea. Err on the side of “less is more” and only add a tiny pinch more of spice or colorant at a time if needed. 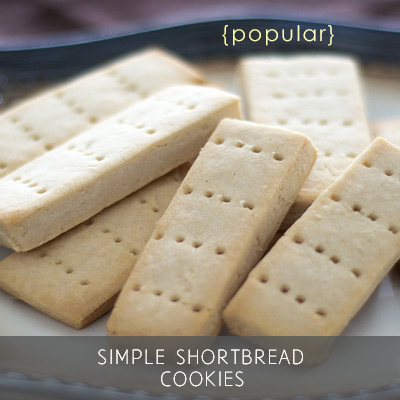 The nice thing about this recipe is that the inside is very flexible… you can use a lot of different fillings. It’s the outside that makes it perfect for something Chinese New Year-sy. 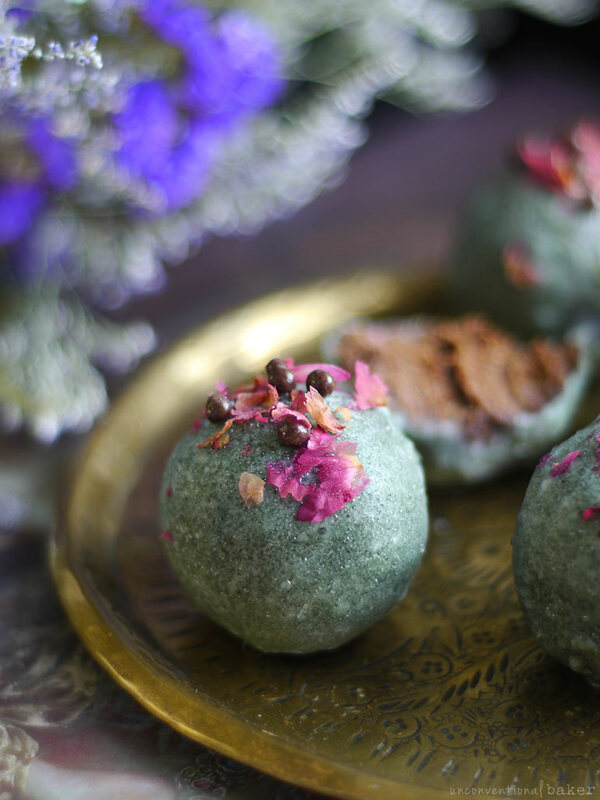 But as mentioned above, the color can be modified with other berry powders and spices for a variety of occasions. 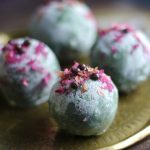 So in terms of filling options, you can either go for a recipe of your choice, or something like these chocolate balls (which is what I used), or these hemp truffles, or these coconut snowballs… I like the chocolate spirulina contrast though. Even though you can’t taste the spirulina in this, I feel like chocolate is a good accompaniment. In Chinese culture, jade (the stone) is symbolic of 5 virtues: compassion, wisdom, courage, modesty, and justice, and it is that quality that makes it sacred. I kind of love that representation. A nice benchmark for a new year. 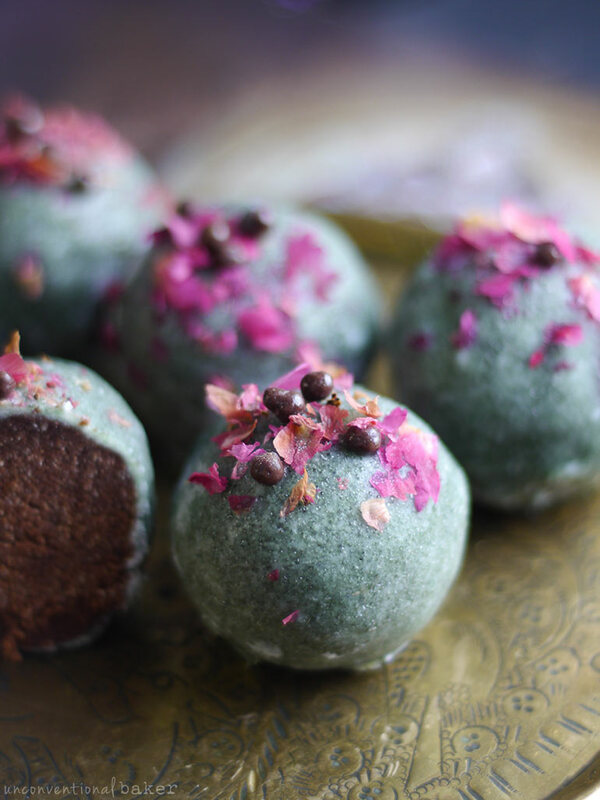 Beautiful jade colored, glazed dessert balls with chocolate “donut hole” filling. 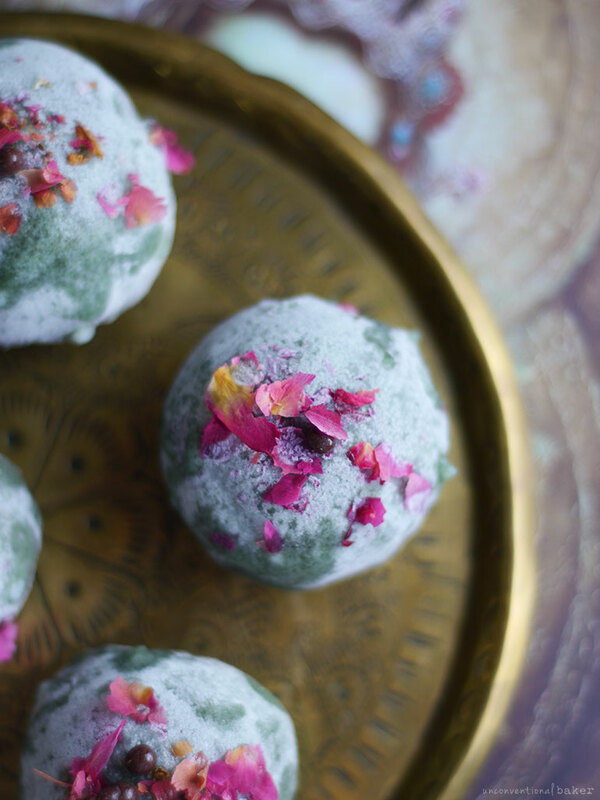 Raw vegan recipe, gluten-free and so pretty. Perfect holiday dessert. 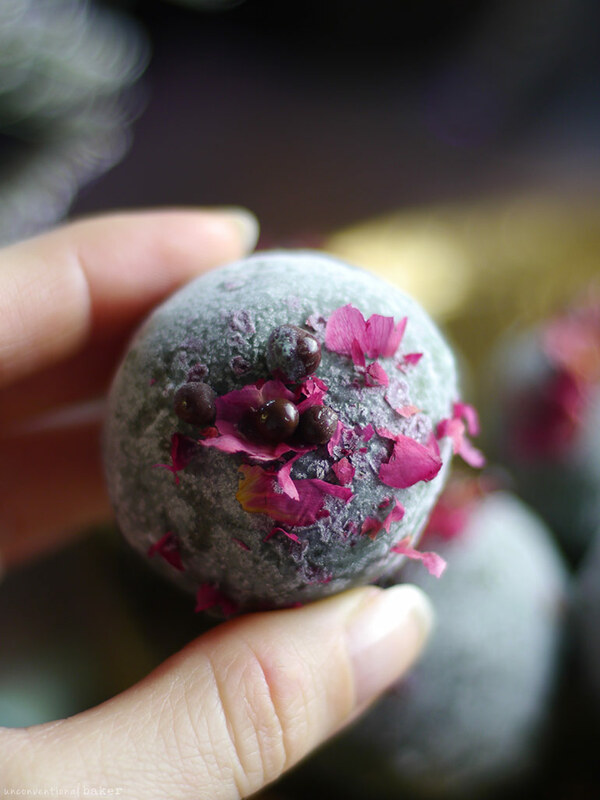 Sprinkle with edible dried rose petals. I also used dark chocolate coated quinoa puffs I had on hand, but cacao nibs can be used instead. Prepare the truffles as per recipe in the link above. Set them up on a tray lined with parchment paper and freeze for 30 mins – 1 hour (ideally use a metal tray / small metal baking sheet as it will chill more thoroughly and make the next steps more efficient). The balls should be cold to the touch in order for the glaze to set properly. For glazing, remove the tray from the freezer. Place a ball on the surface of a fork and dunk into the glaze, roll around to coat. Lift the ball out, wiping the bottom of the fork tines on the edge of the bowl to remove excess glaze from the ball (see notes), and set the glazed ball back on the chilled parchment-lined tray. Repeat with the remaining balls. Note, if you’ve got a large batch to work through, you may want to separate the balls onto several metal trays and keep them frozen, with the exception of the batch you are working with to ensure the glaze sets easily (the glaze sets when it comes into contact with cold). 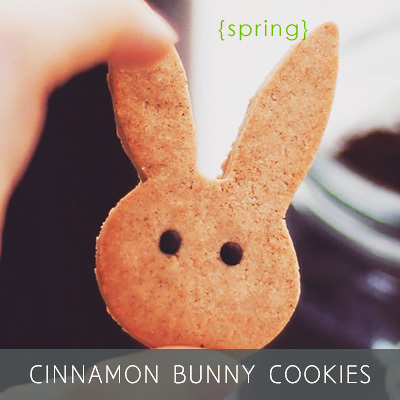 Optional: sprinkle with petals or cacao nibs, etc. at this stage to decorate. Once you’re finished glazing all the balls, return the trays to the freezer for 20 mins to fully set. Enjoy! Keep leftovers refrigerated or frozen until serving. 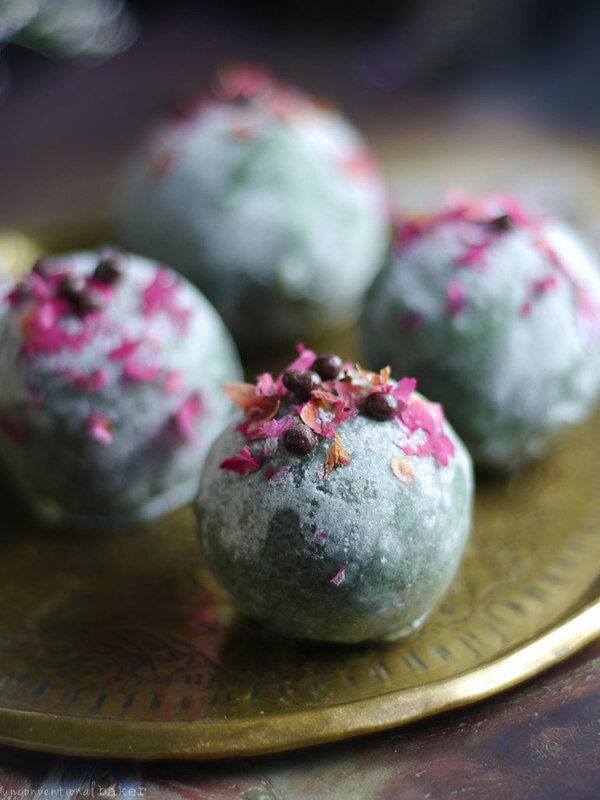 This recipe contains an affiliate link to the rose petals I used to decorate the truffles. Oh my! Those truffles look so tasty and delicious! 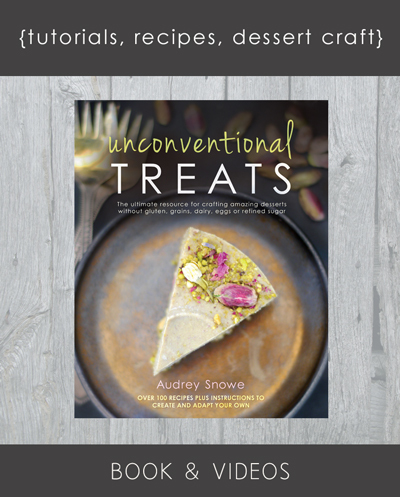 Hi Audrey, these look AMAZING! Where can I buy the powders from for the colors? Hi Soni. I buy my powders from a variety of sources. Online I like to shop on iherb.com or amazon for most of them. In person, nearly every health food shop carries spirulina (which is what I used here), turmeric (also in grocery stores; for yellow), and even beetroot powder or cranberry powder, etc. (though those can be a little more rare — look in supplements section; for pink). Ethereal beauties. Ephemeral as they will not last long. That made me smile :) Thank you! These really are the colour of jade! 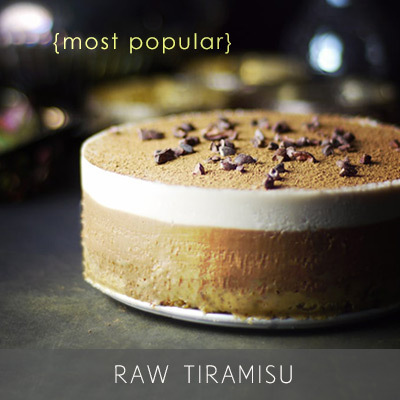 Looks stunning in contrast to that rich looking filling – mm, I can’t wait to try these! Thanks so much, Rosie :) Hope you like them. I am in love with that glaze! have never tried to make ‘glaze’ using coconut oil, but i think it makes miracles.. can’t wait to experiment a little bit! Thank you, Audrey, for this lovely post! Happy this inspired some ideas :) I was surprised myself that I haven’t done this sooner — it’s so simple. And I like the color option.